CANTON, Mass. 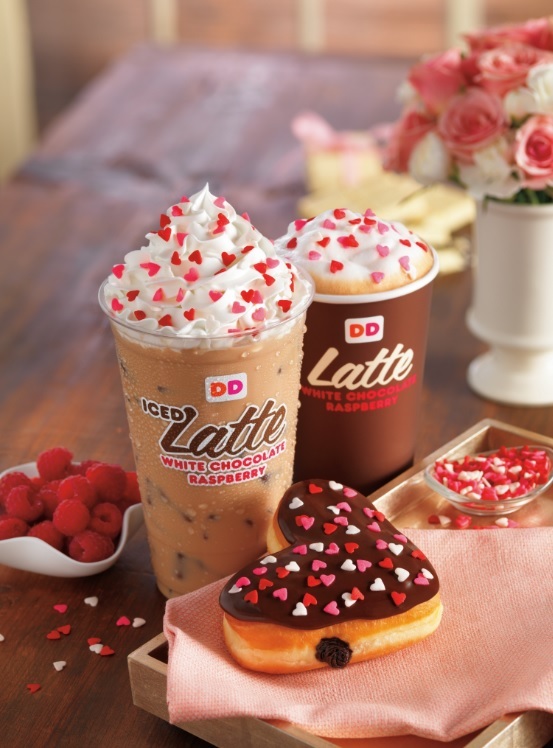 (February 5, 2015) – With Valentine’s Day approaching, Dunkin’ Donuts is celebrating the season with a set of sweet social media promotions, including a salute to winter Iced Coffee drinkers and an opportunity for fans to send sweet tweets to their sweetheart. Both programs offer the chance to win a prize sure to warm any heart: round-trip travel certificates for two on JetBlue. Dunkin’ Donuts is the exclusive coffee provider of JetBlue, with Dunkin’ Donuts coffee and tea served on-board all JetBlue flights throughout the Americas. Leading off, with this week marking the halfway point of winter, Dunkin’ Donuts is launching a special Twitter and Instagram contest to celebrate guests who stay cool during the coldest months with the brand’s famous Iced Coffee. Beginning today and continuing through Monday, February 9, fans are invited to share photos showing how they keep running on Dunkin’ Donuts Iced Coffee in winter, using the special hashtag #IceDDCoffeeContest for the chance to win one of ten $100 mGifts. In addition, one grand prize winner will receive two JetBlue travel certificates. No purchase necessary, 18+ to enter. For official rules and additional information related to the Dunkin’ Donuts IceDD Coffee Contest, visit http://dun.kn/18KXJkX. Next week, Dunkin’ Donuts is bringing back a heartfelt Twitter sweepstakes in honor of the return of its heart-shaped donuts. From February 11 to February 13, fans are invited to tweet a message to their loved one, using the hashtag #DDHearts & #Sweeps. On February 13, up to 10 participants will receive a $100 mGift and have their tweet turned into a special donut dedication video they can send to their Valentine. Each video will feature their message and a heart-shaped donut personalized with the name of their sweetheart. The donut will be personally created and decorated by Rick Golden, Dunkin’ Donuts’ Manager of Donut Excellence. One grand prize winner will also receive two JetBlue travel certificates. No purchase necessary, must be 18+ to enter. Void where prohibited. For additional terms and conditions related to Dunkin’ Donuts’ “Heartfelt” Twitter Sweepstakes, please visit: http://dun.kn/1EGWv7D. For Valentine’s Day, Dunkin’ Donuts has put a little extra “heart” into its menu by bringing back two varieties of its beloved heart-shaped donuts. Dunkin’ Donuts’ Brownie Batter Donut is a heart-shaped donut filled with delicious chocolatey brownie batter flavored buttercreme filling, topped with chocolate icing and heart sprinkles. The Cookie Dough Donut is a heart-shaped donut with cookie dough flavored buttercreme filling, topped with chocolate icing and chocolate chips. Perfect for both coffee and chocolate lovers, Dunkin’ Donuts’ new White Chocolate Raspberry Coffee and Lattes, served hot or iced, combine the rich flavor of white chocolate with delicious and fruity raspberry flavor. For an extra festive touch, the White Chocolate Raspberry Lattes are sprinkled with a red, pink and white hearts topping. All items are available at participating Dunkin’ Donuts restaurants through the end of February. Founded in 1950, Dunkin' Donuts is America's favorite all-day, everyday stop for coffee and baked goods. Dunkin' Donuts is a market leader in the hot regular/decaf/flavored coffee, iced coffee, donut, bagel and muffin categories. Dunkin' Donuts has earned the No. 1 ranking for customer loyalty in the coffee category by Brand Keys for eight years running. The company has more than 11,300 restaurants in 36 countries worldwide. Based in Canton, Mass., Dunkin' Donuts is part of the Dunkin' Brands Group, Inc. (Nasdaq: DNKN) family of companies. For more information, visit www.DunkinDonuts.com.